The USB 2.0 RG2304N is a four port USB 2.0 high-speed extension solution with the ability to connect USB 3.0, 2.0 and 1.1 devices such as flash drives, keyboards, mice, interactive whiteboards, and isochronous devices (e.g. webcams and audio devices) to hosts over CAT 5e/6/7 cabling or across a GigE Local Area Network (LAN) using existing infrastructure cabling. It features full device and hub support as well as Mass Storage Acceleration for improved USB 2.0 device bulk transfer speeds over previous generation extenders and the ExtremeUSB® suite of features. Product is sold as unbranded, turnkey integration, and available for private label. The USB 2.0 RG2304N extends USB 3.0, 2.0, and 1.1 peripherals such as flash drives, keyboards, mice, interactive whiteboards, and isochronous devices (e.g. webcams and audio devices) over CAT 5e/6/7 cabling or across a Gigabit Ethernet Local Area Network (LAN) and supports modern USB 3.0 controllers. The RG2304N includes the ExtremeUSB® suite of features such as true plug and play (no software drives required) and compatibility with all leading operating systems. 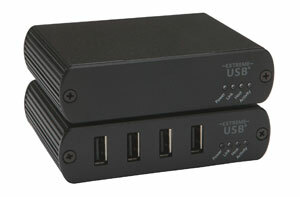 Up to 30 USB devices or hubs can be supported over LAN. Product is sold as unbranded, turnkey integration, or available for private label. Please note: if SwitchableUSB is required, please refer to the RG2304GE-LAN or RG2304S extender models.